Last week I went to a guitar show in Philadelphia. 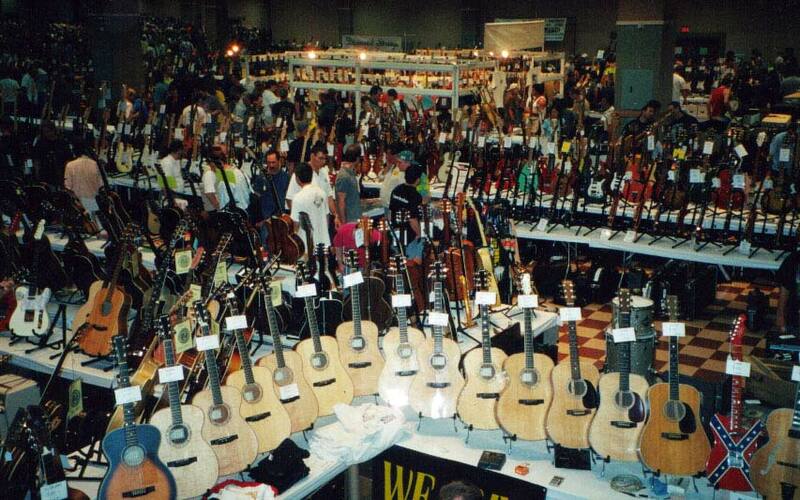 "Guitar shows" are held almost every weekend somewhere in the country. They are public events in large rooms (like convention centers) with hundreds of guitar dealers (like me) displaying thousands of guitars (like this). We buy and sell and trade... and generally have a great time being around so many guitars. I go to the nearby shows, like Philadelphia... and the semi-nearby shows, like Nashville. As I was packing the truck to go the show, my neighbor John asked if I'd try to sell his semi-working accordion. Since odd, non-guitar instruments occasionally turn up at these shows, I took it along. Much to my surprise, on Saturday someone stopped at my booth and bought it. As this perfect stranger was paying for this imperfect instrument, we started talking about, you guessed it, guitars. He mentioned some unusual models he had at home, like a collection of Competition Mustangs. (In the late-1960s Fender made a series of Mustang guitars and basses with racing stripes on them...) I mentioned that I had a collection of Fender Antigua guitars. (In fact they're on display in the back of the store now) He said, "Wow, I just happen to have an Antigua pickguard for a Fender Starcaster! If you ever need that let me know!" (The Starcaster was Fender's late-1970s attempt to mimic the semi-hollow Gibson ES-335. It was a market failure.) I said to him, "I have a lot of Antiguas, but I don't think I've ever even SEEN an Antigua Starcaster! But if I ever get one, and need a matching pickguard, I'll give you a call!" Later that evening, I had dinner with some old guitar show friends. We had a great time reminiscing about the prehistoric days of guitar shows, in the early 1980s... when we bought and sold and traded "used" guitars... before anyone started calling them "vintage." I told them that I first heard about guitar shows from a wacky guy from Maryland named Steve, who had a store called Angela Instruments. One day in May, 1981, Steve stopped at Pittsburgh Guitars on his way to New York City. He rambled on about a group of guys getting together to sell guitars (and buy and trade!) at the Skyline Motor Lodge in Manhattan. I was so impressed that I went to the very next New York show, and then twice a year for the next 20 years! The next day (Sunday) we bought (and sold) (and traded) some more guitars, and then had a smooth drive home to Pittsburgh. I opened the package... and inside, wrapped in bubble wrap... with no note or letter... was a pickguard for an Antigua Starcaster! I honestly don't know what this means. - The accordion guy was from Long Island, NY, and I never mentioned Steve to him. I couldn't have. At that time I hadn't thought of Steve in years. - At dinner with my old-time friends, I never mentioned Fender Antigua guitars or their pickguards. - Besides, in order for this package to arrive on Monday, Steve must have mailed it by Saturday morning, long before I even mentioned him that evening. PS: Coming in two weeks: our Martin Guitar clinic at The Rex Theater. There will be free strings, discounts on guitar set-ups, a Martin LXM guitar give-away contest, interesting and unique Martins from the factory, a display of the Pittsburgh Guitars Vintage Martin Collection and lots of great music. After the Martin Clinic we'll have a free concert by Mac Martin & The Dixie Travelers. PPS: Antigua Mini-history: Fender first used this unusual gray/green-ish sunburst in 1967 on their Coronado guitars and basses, plus their acoustics. They quickly stopped, but eleven years later, in 1978, decided to try it on all of their models. They quickly stopped again. This week started out pretty strange, too. Out of the blue, I got an email from the accordion guy! He said that he was very happy with the accordion, and he wanted to show me pictures of the Competition Mustangs that he told be about in Philadelphia... Here they are. I quickly wrote back, and asked him about the Antigua Starcaster Pickguard. (If you recall, he mentioned it in the first place because we were talking about unusual Fender colors.) He said that he bought the pickguard in January on ebay... from Angela Instruments! Next, I called Steve at Angela. After the usual, "Nice-to-hear-from-you" stuff, he told me that late last year he bought a box of old Fender parts from a retired store owner. In the box were several pickguards for, of all things, Antigua Starcasters. Apparently, while I was driving to Philly for the guitar show, Steve's son (who I've never met) was coincidentally passing through Pittsburgh, and stopped at Pittsburgh Guitars. The son saw my collection of Antigua guitars in the showcase at the back of the store. And that night he called his dad to tell him about it. Steve said, "I know Pittsburgh Guitars, that's Carl's store!" And the next morning he put an Antigua Starcaster pickguard in the mail to me, as a surprise gift. 1) Steve bought a bunch of parts. He's done that before, so that isn't unusual. 2) He's been selling the parts on ebay. Again... not unusual. 3) The accordion guy likes wacky Fender colors. He'd never seen an Antigua Starcaster, but he was intrigued by the pickguard he saw on ebay, so he bought it. That's perfectly normal. 6) The Antigua display in the back of the store is eye-catching... It's not surprising that he'd tell his dad about it. It all makes sense now. There's really nothing in the above story that is impossible. I admit that it seemed a bit miraculous when I opened that box and saw the pickguard. But now that I know all of the facts, I see that the only real coincidence was that Steve's son was in Pittsburgh the same weekend as the Philadelphia show... Oh, and that I met the accordion guy out of the 3000 people at the show... And that we had a conversation about Antiguas.... And that I hooked up with the other dealers for dinner... And that I chose to put the Antiguas on display a few days before Steve's son happened to be passing the store... And that Steve had more than one Antigua Starcaster pickguard and that's what he decided to send me rather than a "Hey, what's new?" note... Yep, it turns out not to be mysterious after all... right? Hey, on a totally different topic: Don't forget our Martin Guitar Clinic next Thursday, June 15th at The Rex Theater. Richard Starkey will be demonstrating some cool Martin Guitars, including some new prototypes. I'll be displaying some truly vintage Martins from not only last century, but the century before! (the late 1800's!) AND we'll have fabulous bluegrass music from Mac Martin and The Dixie Travelers! All for free! Thursday, at The Rex. 7PM. Even in 1979 I knew that cell phones were a possibility. (In fact, in my wacky college days I had a regular home phone under the front seat of my car, so at any moment, for humorous effect, I could pull it out and pretend to make a call.) And of course, Star Trek communicators showed us what phones of the future would look like. But never in my wildest dreams could I have predicted the internet and email. I could not have imagined that we'd have a "web site" - a complicated, multi-page ad... available for free, 24 hours a day, for the world to view... and that strangers, and friends, could instantaneously write to us from distant lands. Even now it's kind of hard to fathom. Last week I got an email from our former guitar teacher Korel... from inside Abbey Road Studios in London! He was there recording with the Goo Goo Dolls, and between takes he sent an email! Then a few days ago, I got an email from the Iceland guy. His band is on tour in England, and he wanted to let me know that he just had his picture taken, walking across Abbey Road! PS: Abbey Road Studios were originally called EMI Studios. After The Beatles took the famous photo, walking across the street (Abbey Road) in front of the studio, the rest of the world started to refer to the studio itself as Abbey Road. In the 1970s EMI officially re-named the studio. Here's a picture of me there, from a few years ago. Tourists from all over the world mimic the Beatles walk across that street every day. Here's a live web cam of the crossing. PPS: Last night's Martin Clinic at The Rex was a lot of fun. We'll have pictures next week! The Icelander's band. He sent me a CD and they're really good! The Martin Clinic last week was a lot of fun! Guitars- Richard Starkey (no relation), the clinician from Martin brought some cool expensive guitars. He also played a few of mine, including my favorite-guitar-made-this-century, my limited edition Martin Grand Ol' Opry model. Mac Martin & The Dixie Travelers also brought two 1938 D-28s, which were fabulous! Information- Richard (no) explained the variety of internal bracing designs used by Martin and the resulting sound differences. He also talked about different ways that necks are attached, and the subsequent changes in sound. Although electric guitars will always be my personal first love, it is fascinating to see how important the construction details are in an acoustic guitar. With an electric instrument, many things impact the eventual sound- the body, the pickups, the amp, etc. With an acoustic, the sound is right there in the wood. Historical display- Just for the fun of it, I took the Pittsburgh Guitars Martin Collection (1874 thru 2000). Here's me during set-up. It was really cool to see everything set up in one long line. Many of our guitars are in storage, and although we do have the display case in the back of the store, I don't often get to see an entire group at one time. Super fine Pittsburgh Guitars Customers- Folks come to an event like this because they truly love guitars. Those are my kind of folks! PS: After the show, for the complete Pittsburgh experience, we took Richard (n.) to Dee's... and then Primanti's... And I got him to sign a drum head! PPS: It was so much fun to look at the Martin Collection that it made me wonder what the Pittsburgh Guitars Beatle Collection would look like, all set up in one room. Bill from The Rex suggested that we have a night of Beatle music at his place, and that would give me an excuse to display a bunch o' stuff... He has Saturday, August 19th open, for such a possibility... I'll let you know how that develops.